Multiple copies of β-carotene biosynthesis genes from commercially important fungi Blakeslea trispora are integrated in Yarrowia lipolytica to produce β-carotene. β-Carotene biosynthesis genes from B. trispora or Mucor circinelloides were expressed in Y. lipolytica respectively, and carRA and carB from B. trispora showed higher activity for production of β-carotene (4.35 mg/l). To produce higher quantities of β-carotene, the engineered strains harboring different copies of carRA, carB, geranylgeranyl diphosphate synthase gene (GGS), and HMG-CoA reductase gene (HMG) were constructed to investigate the yield of β-carotene. The engineered strain YC607, with three copies of carRA, carB, and GGS and two copies of HMG could produce 72.89 mg/l of β-carotene during shake flask culture. Furthermore, 613.87 mg/l of β-carotene was obtained with fed-batch fermentation by feeding glycerol. β-Carotene biosynthesis genes from B. trispora can be expressed in Y. lipolytica, and multiple copies of β-carotene synthesis genes can produce high amounts of β-carotene. β-Carotene is a carotenoid that has been applied to pharmaceuticals, nutraceuticals, cosmetics, feed additives, and as food colorants [1,2]. Currently, most β-carotene is produced through chemical synthesis or fermentation by microorganisms . Large-scale fermentation by Blakeslea trispora is a commercially important source of natural β-carotene, but it cannot satisfy the demand of the growing market due to its associated complicated method of mixed strain fermentation . With the development of synthetic biology and metabolic engineering, the heterologous expression of β-carotene biosynthesis genes has become a potential strategy to solve the current dilemma. Now the heterologous expression of the β-carotene has made a series of progress in Escherichia coli [3,5] and yeast system. Yield of β-carotene in Saccharomyces cerevisiae  and Pichia pastoris  were lower than that in E. coli, but the E.coli was not a generally recognized as GRAS (generally recognized as safe) organism using in food industry. Therefore, it is necessary to optimize or investigate other yeast systems to product the β-carotene. Yarrowia lipolytica has emerged as a GRAS organism for production high value-added chemicals in recent years, such as Eicosapentaenoic Acid (EPA), which has been a commercial product for nutritional supplement . Barth et al. constructed a Y. lipolytica strain producing lycopene through optimization of metabolic pathways . A β-carotene-producing strain was created by introducing carotenoid gene from Mucor circinelloides, however the yield was low . Although β-carotene biosynthetic pathway of B. trispora was elucidated , previous studies have demonstrated poor heterologous expression. The objectives of this study are to determine whether these genes are functional in Y. lipolytica and further to assemble multiple copies of β-carotene biosynthesis genes into the genome of Y. lipolytica to improve β-carotene production. E. coli DH5α (Beijing ConWin Biotech Co., Ltd) was used as the host for plasmid construction. Y. lipolytica ATCC20362 purchased from the American Type Culture Collection (ATCC) was used as the host for the β-carotene biosynthesis pathway. All engineering strains are shown in supplementary Table 1. LB medium (1% peptone, 0.5% yeast extract, and 1% NaCl) was used to cultivate E. coli. YPD medium (2% glucose, 2% peptone, and 1% yeast extract) was used to cultivate Y. lipolytica. Minimal medium (MM medium) described by Barth was applied to cultivate recombinant Y. lipolytica . The primers and plasmids used in our study are listed in supplementary Tables 2 and 3. Sequence of carB and carRA (GenBank: AY176662) from B. trispora strain F-744, and carB(M) (Genbank: AJ238028) and carRP (Genbank: AJ250827) from M. circinelloides strain NRRL 2457 were codon-optimized according to the codon bias of Y. lipolytica, based on the Codon Usage Database. The geranylgeranyl diphosphate synthase gene (GGS, GenBank: XM_502923) and the homology arms (INTF.5N and INTF.3N) for integration into INTF (GenBank: YALI0F3161413 to YALI0F3162449) were amplified from the genome of ATCC20362. The carB, carRA, carB (M), carRP, and GGS, obtained by NcoI/NotI digestion, were inserted into the plasmids pWSV-FBAin-lip1, pWSV-GPD-lip2, and pWSV-YAT1-lip2 respectively, to construct the expression cassettes pWSV-FBAin-carB-lip1, pWSV-GPD-carRA-lip2, pWSV-FBAin-carB(M)-lip1, pWSV-GPD-carRP-lip2, and pWSV-YAT1-GGS-lip2. Subsequently, the homology arms INTF.5N and INTF.3N, together with the expression cassettes FBAin-carB-lip1, GPD-carRA-lip2, and YAT1-GGS-lip2, were successively inserted into pSK-URA3 to generate pSK-B-RA-GGS-INTF-U (Figure 1A). Then FBAin-carB(M)-lip1 and GPD-carRP-lip2 were then substituted for FBAin-carB-lip1 and GPD-carRA-lip2 of pSK-B-RA-GGS-INTF-U to generate pSK-B(M)-RP-GGS-INTF-U (Figure 1B). Figure 1: Plasmids maps used in this study. (a) pSK-B-RA-GGS-INTF-U harboring YAT1-GGS-lip2, GPD-carRA-lip2, FBAin-carB-lip1, URA3, INTF.5N, and INTF.3N. (b) pSK-B(M)-RP-GGS-INTF-U carrying YAT1-GGS-lip2, GPD-carRP-lip2, FBAin-carB(M)-lip1, URA3, INTF.5N, and INTF.3N. (c) pSK-HMG-URA3-INTB containing EXP-HMG-Aco, URA3, INTB.5N, and INTB.3N. HMG-CoA reductase gene (HMG, GenBank: XM_503558) and homologous arms (INTB.5N and INTB.3N) for integration into INTB (GenBank: YALI0B700678 to YALI0B701707) were amplified from the genome of ATCC20362. HMG cut by NcoI/NotI was ligated into pWSV-EXP-Aco to generate pWSV-EXP-HMG-Aco. Next, INTB.5N, INTB.3N, and EXP-HMG-Aco were ligated into pSK-URA3 to generate pSK-HMG-U-INTB (Figure 1C). Construction of the remaining plasmids are shown in supplementary data transformation and cultivation of Y. lipolytica: A URA3 deficient strain was transformed with linear DNA using the protocol of Barth and Gaillardin . A 100-ml flask containing 5 ml YPD medium (pH 4.0, adjusted using 1 M citric acid-Na citrate buffer) was inoculated with a single colony and shaken at 28°C for 16 h. Then, 500 μl cultures were transferred into a 250 ml flask containing 10 ml YPD medium and incubated overnight. When the OD600 was approximately 5.0, all cells were harvested by centrifugation at 3500 × g for 5 min and washed twice with TE buffer (pH 7.5). Approximately 20 ml of 100 mM lithium acetate (pH 6.0) was used to resuspend the cells and the sample was incubated at 28°C for 1 h. Finally, the treated cells were centrifuged at 3500 × g for 5 min and resuspended in 2 ml of 100 mM lithium acetate to obtain competent cells. Approximately 1 μg of linearized plasmid mixed with 50 μg of denaturized carrier DNA (Sigma) and 100 μl of competent cells were incubated at 28°C for 15 min. Then, 700 μl of 40% PEG4000 was added and the sample was shaken at 100 rpm and 28°C for 1 h. Heat shock at 39°C for 10 min was performed and then 1.2 ml of 100 mM lithium acetate was added. The mixture were spread on solid MM medium and incubated for 4 days at 28°C. Transformants that appeared yellow on the plate were picked and cultivated at 28°C for 96 h supplementary Figures 1 and 2. Engineered Y. lipolytica, inoculated in 20 ml of YPD medium, was shaken at 28°C until the OD600 was approximately 1.0. Cells (100 μl) were spread on solid MM medium containing 100 μg/ml 5-fluoroorotic acid (5-FOA), 75 μg/ml uridine, and uracil, and incubated for 4 days at 28°C. A yellow colony was selected for the next integration. One transformant colony was inoculated in 5 ml MM medium and incubated at 28°C until the OD600 was approximately 1.0. Subsequently, 1 ml of culture medium was transferred into 20 ml of MM medium and incubated at 28°C overnight. Ten milliliters of culture medium were centrifuged at 3500 × g for 10 min and washed with 50 mM phosphate buffer (pH 7.0). Pelleted cells were resuspended in 600 μl of lysis buffer and glass beads were added at a volume of 50% of the liquid. The suspension was vortexed five times for 1 min each and placed on ice immediately. The extract was centrifuged at 3500 × g and 4ºC for 5 min, and the suspension was transferred to a new tube on ice for activity assays. The HMG-CoA reductase activity assay was modified according to the description by Asadollahi and Donald . For this, 50 μl of 3 mM NADPH and 50 μl of cell extract were added to a 1 ml quartz cuvette containing 850 μl of 100 mM phosphate buffer. After 5 min of equilibration at 30°C, 50 μl of 3 mM HMG-CoA was added to the cuvette and the change in absorbance at 340 nm (A340) was recorded over 1 min. Enzyme activity (U) was defined as the quantity of NADP (nmol) produced per min . The protein content of the cell extract was determined using a BCA Protein Assay Kit (Beijing ComWin Biotech Co., Ltd) with bovine serum albumin as the standard. One colony of genetically modified strain was inoculated in 5 ml YPD liquid medium and incubated at 28°C until the OD600 was approximately 1.0. Subsequently, 1 ml of the culture was transferred into 20 ml medium containing different concentrations of glucose and glycerol (2% glucose, 4% glucose, 1% glucose and 1% glycerol, 2% glycerol, 4% glycerol) and cultivated at 28°C for 96 h.
For lab-scale culture, fed-batch fermentation was carried out in a 5 l fermenter. A 250 ml seed shake flask with 25 ml of YPD medium was inoculated with one loop of YC607 and incubated at 28°C for 24 h. Subsequently, three 750 ml seed shake flasks with 100 ml of YPD medium each were inoculated with 5 ml of culture and incubated at 28°C for 24 h. Finally, 300 ml of seed culture were inoculated into 3000 ml of YPD medium in the fermenter and incubated at 28°C. Dissolved oxygen was kept at 30% and pH was maintained at 5.5 using ammonia. During the fed-batch fermentation, 70 g/l of glycerol was fed to maintain the glycerol above 2%. Quantification of β-carotene was performed by high-performance liquid chromatography (HPLC) . One milliliter of fermentation broth was centrifuged at 13200 X g for 2 min and lyophilized overnight to measure dry cell weight. Equal quantities of cells were harvested for β-carotene extraction. The pelleted cells were resuspended in 1 ml acetone and agitated with ultrasound for 30 min. The acetone extract was centrifuged at 13200 X g for 2 min and the suspension containing β-carotene was filtered with a 0.45 μm filter for subsequent analysis. The β-carotene content of the extract was determined using an HPLC system (Agilent 1260 Infinity) equipped with a C18 column (Hypersil ODS 5 μm, 4.6 mm × 250 mm) . A sample (10 μl) was injected into the C18 column and detected at 472 nm with the mobile phase as shown in supplementary Table 4 . Statistical analysis is performed with the statistical software SPSS18.0. All data, which were obtained from at least three independent experiments, are expressed as means ± standard deviations. The t-test is used to compare the difference between various groups, and p<0.05 or p<0.01 indicates statistically different. High-level carotenoid was achieved in E. coli by expressing bacterial carotenoid genes , however expressional activity of bacterial carotenoid genes were poor in yeast system . Xie et al. also showed that carotenoid genes from eukaryotic organisms are more suitable than that from bacteria in S. cerevisiae . Therefore, the codon-optimized biosynthetic genes (carRA and carB from B. trispora, and carB (M) and carRP from M. circinelloides) from two important microorganisms for producing of β-carotene were expressed in Y. lipolytica. The plasmid pSK-B-RA-GGS-INTF-U or pSK-B(M)-RP-GGS-INTF-U were integrated into the host strain Y2224 (URA3-deficient strain from Y. lipolytica ATCC20362) respectively, and the positive colonies were selected to analyze the β-carotene productivity. The transformants with highest β-carotene yield were designed YC202 (from B. trispora) and YM202 (from M. circinelloides). Table 1 shows that the biomass of strain YC202 and YM202 are similar to ATCC20362, indicating that introduction of β-carotene biosynthetic pathways does not affect the strain growth. The β-carotene yield of YC202 was 4.35 ± 0.14 mg/l while that of YM202 was 3.86 ± 0.13 mg/l, and there is significantly difference between β-carotene yield of two strains (p<0.05). The results showed that carRA and carB of B. trispora or M. circinelloides were functional in Y. lipolytica, however expression level of β-carotene biosynthetic gene from B. trispora was better than that from M. circinelloides in Y. lipolytica. Table 1: Comparison of biomass and β-carotene yield between strains integrated β-carotene biosynthetic genes from B. trispora or M. circinelloides. HMG-CoA reductase is a rate-limiting enzyme in the mevalonate pathway, and mevalonate is generally considered an effective supplier of the isoprenoid precursor . Overexpression of HMG-CoA reductase enhances isoprenoid production in several yeast species such as S. cerevisiae  and Candida utilis . One copy HMG-CoA reductase gene (HMG) of was inserted into YC202 by plasmid pSK-HMG-U-INTB to create the YC306. HMG-CoA reductase enzymatic activity was assayed for YC202 and YC306. Overexpression of HMG increased enzymatic activity from 1.06 ± 0.04 U/(mg protein) in YC202 to 1.77 ± 0.06 U/(mg protein) in YC306, and the difference was significant (p<0.01). Meanwhile, β-carotene production increased from 4.35 ± 0.14 mg/l in YC202 to 6.96 ± 0.15 mg/l in YC306, and the difference was significant (p<0.01). Overexpression of the HMG enhanced catalytic activity by approximately 65%, which simultaneously stimulate an increase in β-carotene yield of approximately 60%. In order to enhance the productivity of β-carotene by multiple genes expression strategy, a recyclable URA3 marker was used to introduce many copies of β-carotene biosynthesis genes by sequential integrations. The URA3 marker in URA3-phenotype transformants can be excised by homologous recombination and ura3-phenotype transformants are identified by FOA-resistant selection for subsequent rounds of transformation . The construction steps of β-carotene biosynthesis in recombinant Y. lipolytica are shown in Figure 2. First, pSK-B-RA-GGS-GUT2-U was inserted into YC306 to create YC413, which introduced the second copy of β-carotene biosynthesis genes and yielded 37.45 ± 0.87 mg/l of β-carotene. Strain YC413 was transformed using pSK-B-RA-GGS-POX2-U to create YC511, which introduced the third copy of β-carotene biosynthesis genes and increased the yield of β-carotene to 53.97 ± 0.83 mg/l. Second copy of HMG, using pSK-HMG-U-INTA, was introduced into YC511 to create YC607. The genetically modified strain YC607, which contained three copies of β-carotene biosynthesis genes, two copies of HMG, accumulated 72.89 ± 1.09 mg/l of β-carotene. Each gene integration resulted in an increase in the yield of β-carotene, and the difference was significant (p<0.01) (Figure 3B). The β-carotene yield displayed a 16.8 fold increase compared to YC202 with one copy of β-carotene biosynthesis gene, indicating that overexpression of the rate-limiting step could effectively increase the yield of the target product in a heterologous host. However, when another copy of HMG was inserted into YC607 strain, β-carotene yield was decreased due to lower biomass. The result indicated that more HMG-CoA reductase might have resulted in accumulation of isopentenyl diphosphate (IPP), farnesyl diphosphate (FPP) and other intermediate pyrophosphate metabolites , and the excess of isoprenoid pyrophosphates may cause potentially toxic effect on cells . Figure 2: Metabolic engineering of Y. lipolytica to produce β-carotene. (a) HMG-CoA reductase activity assay of YC202 and YC306 where U was defined as the quantity of NADP (nmol) produced per min. 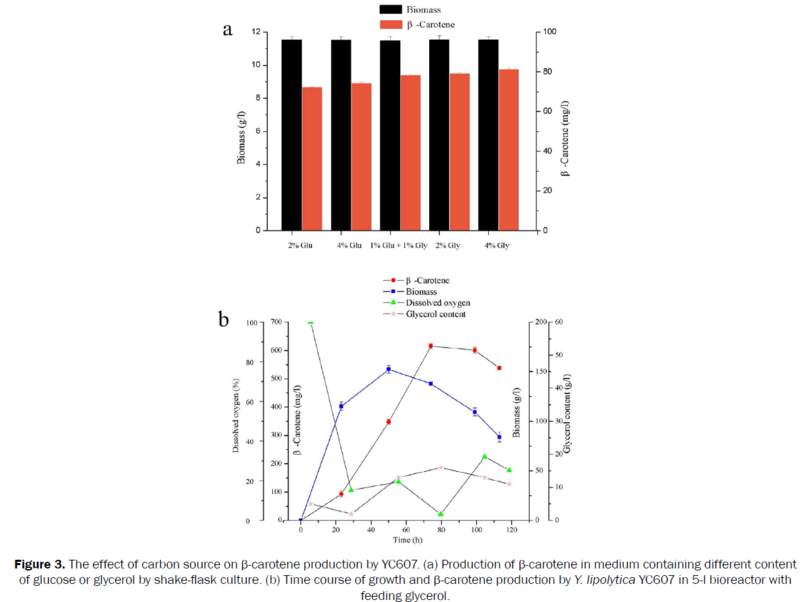 (b) Biomass and β-carotene content produced by the engineered Y. lipolytica when the strains were cultivated in YPD medium for 96 h.
Figure 3: The effect of carbon source on β-carotene production by YC607. (a) Production of β-carotene in medium containing different content of glucose or glycerol by shake-flask culture. (b) Time course of growth and β-carotene production by Y. lipolytica YC607 in 5-l bioreactor with feeding glycerol. In a previous study, optimization of a fermentation process was shown to enhance carotenoid production in yeast . Effect of carbon sources on production of β-carotene by the YC607 was investigated in shake-flask culture, and 4% glycerol could improve β-carotene production by 12% compared to 2% glucose (p<0.01). Sucrose gradient centrifugation experiment showed that most lycopene was stored in lipid body fraction in lycopene-producing Y. lipolytica strain . The glycerol can increase synthesis of lipid body catalyzed by glycerol kinase resulting in storing more β-carotene in lipid body . Furthermore, fed-batch cultivation was conducted in a 5l bioreactor for YC607. The time course of fermentation is shown in Figure 3A. During the process the glycerol was fed to be maintained at 10-20 g/l. As can be seen in Figure 3B, the biomass and β-carotene content increased sharply at initial 50 h and then the biomass started to drop, but maximum production of β-carotene was up to 613.87 mg/l at 80 h. The result indicated that the Y. lipolytica YC607 could produce higher content of β-carotene by high-density culture method. In conclusion, our results represent the first report of the expression of β-carotene biosynthesis genes from B. trispora in yeast. We showed that the introduction of multiple copies of GGS, carB, carRA, and HMG could significantly enhance β-carotene production. Finally, using glycerol as carbon source during fermentation process enhanced β-carotene production, indicating that Y. lipolytica could be a potential microorganism factory for the synthesis of carotenoids. Ajikumar PK, et al. Terpenoids: opportunities for biosynthesis of natural product drugs using engineered microorganisms. Mol Pharm. 2008;5:167-190. Das A, et al. An update on microbial carotenoid production: application of recent metabolic engineering tools. Appl Microbiol Biotechnol. 2007;77:505-512. Yang J and Guo L. Biosynthesis of Î²-carotene in engineered E. coli using the MEP and MVA pathways. Microb Cell Fact. 2014;13:160. Mehta BJ, et al. Mutants and intersexual heterokaryons of Blakeslea trispora for production of ß-carotene and lycopene. Appl Environ Microbiol. 2003;69:4043-4048. Zhao J, et al. Engineering central metabolic modules of Escherichia coli for improving ß-carotene production. Metabol eng. 2013;17:42-50. Xie W, et al. Construction of a controllable ß-carotene biosynthetic pathway by decentralized assembly strategy in Saccharomyces cerevisiae. Biotechnol Bioeng. 2014;111:125-133. Araya-Garay J, et al. Construction of new Pichia pastoris X-33 strains for production of lycopene and ß-carotene. . Appl Microbiol Biotechnol. 2012;93:2483-2492. Matthäus F, et al. Production of lycopene in the non-carotenoid-producing yeast Yarrowia lipolytica. Appl Environ Microbiol. 2014;80:1660-1669. Gao S, et al. One-step integration of multiple genes into the oleaginous yeast Yarrowia lipolytica. Biotechnol Lett 2014;36:2523-2528. Rodríguez-Sáiz M, et al. Blakeslea trispora genes for carotene biosynthesis. Appl Environ Microbiol. 2004;70:5589-5594. Barth G, et al. Nonconventional yeasts in biotechnology. Yarrowia lipolytica. 1996;313-388. Donald K, et al. Effects of overproduction of the catalytic domain of 3-hydroxy-3-methylglutaryl coenzyme A reductase on squalene synthesis in Saccharomyces cerevisiae. Appl Environ Microbiol. 1997;63:3341-3344. Qureshi N, et al. Purification of beta-hydroxy-beta-methylglutaryl-coenzyme A reductase from yeast. Biochem. 1976;15:4185-4190. Shao Z, et al. DNA assembler, an in vivo genetic method for rapid construction of biochemical pathways. Nucleic Acids Res. 2009;37:e16. Maury J, et al. Reconstruction of a bacterial isoprenoid biosynthetic pathway in Saccharomyces cerevisiae. FEBS letters. 2008;582:4032-4038. Xie W, et al. Construction of lycopene-overproducing Saccharomyces cerevisiae by combining directed evolution and metabolic engineering. Metabolic eng. 2015;30:69-78. Gardner R, et al. Sequence determinants for regulated degradation of yeast 3-hydroxy-3-methylglutaryl-CoA reductase, an integral endoplasmic reticulum membrane protein. Mol Biol Cell. 1998;9:2611-2626. Shimada H, et al. Increased Carotenoid Production by the Food Yeast Candida utilis through Metabolic Engineering of the Isoprenoid Pathway. Appl Environ Microbiol.1998;64:2676-2680. Beopoulos A, et al. Control of lipid accumulation in the yeast Yarrowia lipolytica. Appl Environ Microbiol. 2008;74:7779-7789. Asadollahi MA, et al. Enhancement of farnesyl diphosphate pool as direct precursor of sesquiterpenes through metabolic engineering of the mevalonate pathway in Saccharomyces cerevisiae. Biotechnol Bioeng. 2010;106:86-96. Faulkner A, et al. The LPP1 and DPP1 Gene Products Account for Most of the Isoprenoid Phosphate Phosphatase Activities inSaccharomyces cerevisiae. J Biol Chem. 1999;274:14831-14837.